Despite the improvement of restorative materials and techniques in the recent decades, the postoperative sensitivity with composite restorations remains a challenge for the restorative dentist. Poor marginal adaptation may produce marginal discoloration, postoperative sensitivity, and secondary caries that would decrease the longevity of composite restorations. 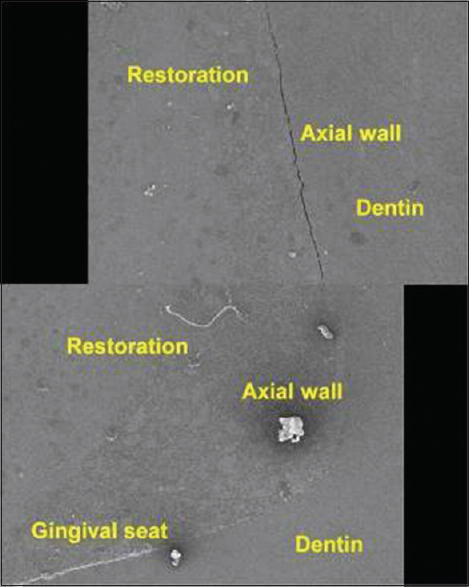 The possibility of marginal failure in composite resin restorations is related mainly to the quality of bond between the dental substrate and the resin and also to stress generated within the restoration due to polymerization shrinkage. The main factors that determine shrinkage stress and consequently, gap formation in composite restorations are degree of polymerization shrinkage, elastic modulus, and viscosity of the composite. Flowable composite resins have been reported to improve marginal adaptation of restorations in relation to their rheological properties. Due to their relative flexibility and low modulus of elasticity, when employed as an intermediate layer, these liners help relieve stresses during polymerization shrinkage of the composite restorations and may provide better adaptation. The discovery of a new category of composites termed as “self-adhering”, in the recent past has revolutionized the phase of adhesive dentistry. This self-adhering flowable composite material combines an all-in-one bonding system, eliminating the need for a separate etching and adhesive application. There is a dearth of literature, with regard to the adaptability of this self-adhering flowable composite to tooth substrates. Owing to the novelty of this material and considering, the importance of understanding its sealing ability, in the present study, the marginal adaptation of self-adhering flowable composite; Dyad flow (which is available as “Vertise flow” in western countries) was evaluated in comparison to the conventional flowable composite (Tetric N-flow) under scanning electron microscope (SEM). Box-only Class II cavities were prepared on the distal surface of 44 human maxillary premolars, with the dimensions of 4 mm buccolingual width, 2 mm mesiodistal depth with the gingival margin at the cementoenamel junction (CEJ). No bevels were placed at any of the cavosurface margins; however, all margins were smoothened using an enamel hatchet. Group II – Gingival floor lined with self-adhering flowable composite, i.e., Dyad flow (Kerr Products, Delhi, India) and restored with universal nanohybrid composite, i.e., Herculite Precis (Kerr Products, Delhi, India). Group I: The cavities were total-etched with 37% phosphoric acid gel for 15 s, rinsed with water for 10 s, and air dried for 2 s. Two coats of Tetric N-Bond were applied onto the cavity surface, gently air dried, and light-cured for 10 s, using a LED curing light (Prime Dental Products Pvt. Ltd., Thane, Mumbai, India) at an intensity of 1,000 mW/cm2. Then, the gingival seat was lined with conventional flowable composite Tetric N-Flow in a uniform thickness of 1 mm which was judged using a William's graduated periodontal probe. The remaining cavity was restored with Tetric N-Ceram, in increments of 2 mm. Each increment was light-cured for 20 s.
Group II: A layer of Dyad flow was applied on the gingival seat of the class II cavity; in uniform thickness of 0.5 mm and rubbed uniformly with a disposable brush as supplied by the manufacturer followed by light-curing for 15 s. A second layer of Dyad flow was applied on the previous layer, in thickness of 0.5 mm and light-cured for 15 s. The etching and bonding procedures were performed similar to that of Group I on the axial wall, buccal, and lingual proximal walls of the cavities but not on the gingival seat. 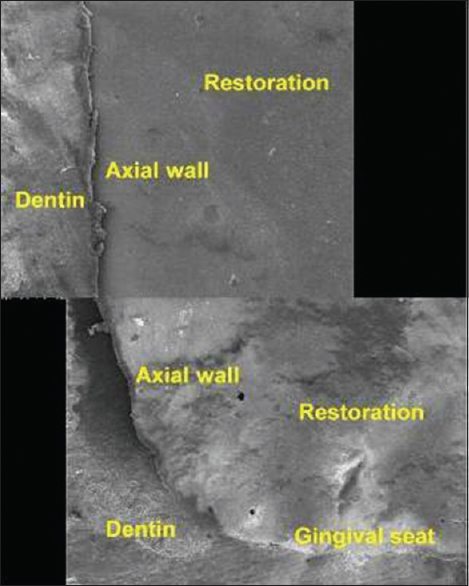 The cavities were restored with Herculite Precis, in increments of 2 mm. Each increment was light-cured for 20 s.
MQ4-Severe gap (>2 μm); slight and severe marginal irregularities. The term “marginal irregularities” means porosities within the adhesive layer, marginal restoration fracture, and/or a bulge within the adhesive layer. The qualitative scores obtained by the principal investigator were decoded by the same colleague, with whom the coding information was kept confidential. The resultant data were then tabulated [Table 1] and statistically analyzed by applying the nonparametric Chi-Square test, using the Statistical Package for the Social Sciences (SPSS), version 16.0 software, (IBM Corporation, India). There was no statistically significant difference between the study groups regarding the marginal adaptation (P = 0.651) [Table 2]. One of the detrimental aspects of Class II composite resin restorations is microleakage at the gingival margin of proximal boxes. This is related to the absence of enamel at gingival margins, resulting in a less stable cementum dentin substrate for bonding. The orientation of the dentinal tubules can negatively affect the quality of hybridization and thus favor leakage in resin-based restorations placed in deep interproximal boxes. The high wettability of flowable composites on the tooth surface ensures penetration into every irregularity and their ability to form layers of minimum thickness, eliminates air inclusion, or entrapment. Flowable composites are recommended for the initial increments that serve as cavity liners in proximal boxes of Class II restorations since the material adapts itself to the internal irregularities of the preparation. 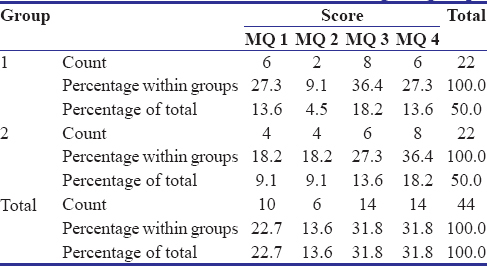 Out of 44 samples in this study, ten showed a score of MQ1 [Figure 1], six samples showed a score of MQ2 [Figure 2], 14 samples each showed a score of MQ3 [Figure 3], and MQ4 [Figure 4]. The highest number of samples in Group I (8) had shown a score of MQ3, whereas in Group II (8), it was MQ4. Thus, it could be inferred that the majority of the samples (16) in the both groups presented with greater marginal discrepancies. In the present study, none of the materials completely eliminated marginal discrepancies. 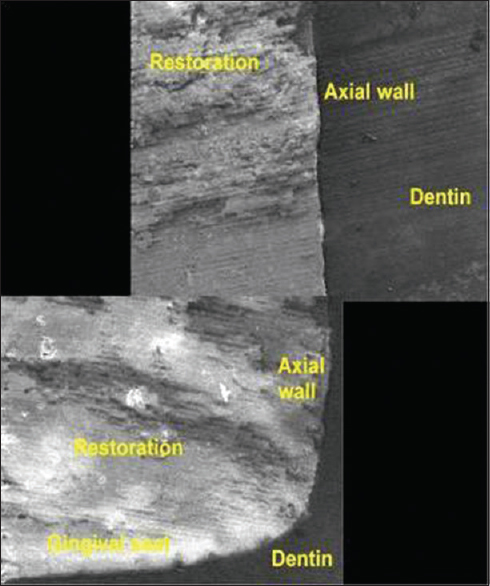 This finding could be attributed to the placement of the cavity margins in dentin, which can be probably explained by the fact that bonding to dentin is difficult because of its high organic content, tubular structure, and its lower surface energy. In the present study, no statistically significant difference was found between the groups contradicting the results of previous studies., In a study, where microleakage of Class V cavities restored with Dyad Flow was compared with two-step total-etch and SEA systems, Dyad Flow showed greater leakage at the apical margin than the other groups that was statistically significant. The application of acid etching provided better occlusal and cervical marginal sealing than those without. Another study, reported better marginal seal of self-adhering composite (Vertise Flow) compared to self-etch primer/flowable composite Tetric flow. In samples, restored with the Vertise flow, dye penetration was found to be lower, which was statistically significant compared to those restored with the Tetric flow. However, for both materials, the dye leakage was lower on the occlusal wall than on the gingival wall. The difference in the results of the previously mentioned studies , from that of the present study could be attributed to the method of evaluation, the cavity design and the configuration factor. In these studies, Class V cavities were selected, and the sealing performance was evaluated regarding the extent of dye penetration visualized under a stereomicroscope at low-magnification (×16). In contrast to the previous studies,, Scanning Electron Microscope (SEM) was used in the present study for the evaluation of marginal adaptation of the tooth-restoration interface at a higher magnification (×200) which provides better visualization. However, the interpretations obtained from two different in vitro methodologies may not correlate to each other and could be misleading. Laboratory studies using Dyad flow, as available from the manufacturer's literature, demonstrated tighter interfacial adaptation to dentin when viewed under SEM at higher magnifications (×1000 and × 5000). This difference could be attributed to the methodology employed, standardization in the preparation of the bonding interface, and the magnification under which the samples were observed. The interfaces were polished successively with increasing grit of SiC paper, and use of alumina paste in decreasing order of their particle size. Hard-tissue microtome is used in the present study which improves the quality of the sections and reduces the time needed to prepare specimens for microscopic analysis. The absence of solvent, higher viscosity, and lower wettability of Dyad Flow, represent a drawback for the material's ability to wet self-etched collagen fibrils. Proper wettability of an adhesive material onto a substrate enables a close adhesive substrate interaction. To enhance the interaction of the material with the substrates, the manufacturer recommends an active agitation step that involves brushing the first layer of material onto the entire cavity surface for 20 s.
In a study by Rengo et al., the use of a gel etchant before application of self-adhering composite (Vertise flow) resulted in higher leakage scores at the dentin margins that were statistically significant from the other groups. Conversely, when Vertise Flow was used without any substrate pretreatment, the quality of the seal was satisfactory and similar to that of the etch-and-rinse system. This finding was interpreted in relation to the higher viscosity of Vertise flow than that of a bonding agent in etch-and-rinse system, which might have led to limited penetration into the network of collagen fibers and within the dentin tubules exposed by phosphoric acid etching. 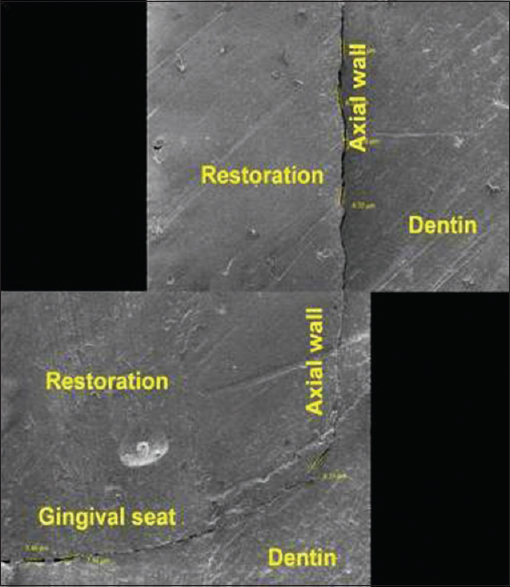 The areas of dentin that had been deeply demineralized yet incompletely infiltrated by the resin were revealed by silver nitrate deposits and have been considered responsible for a defective interfacial seal. Similarly, self-adhering composite (Vertise flow) combined with an all-in-one SEA resin provided a better marginal seal than when it was used individually. The combination provided the least microleakage scores at the gingival margin than the occlusal margins with a significant difference. The sealing ability of Vertise Flow was superior compared to five other combinations of self-adhesive systems and the proprietary flowable composites, when evaluated using silver nitrate dye penetration under SEM. In contrast to traditional SEM observation in high vacuum mode, low vacuum mode for SEM evaluation was used in their study, that permits detection of interfacial staining of silver nitrate and may prevent simple artifacts from being formed at the interface. In the present study, the SEM evaluation was carried out in the high vacuum mode, which may have created artifacts during the observation of the samples. Such artifacts that cannot be totally avoided in a scientific investigation may have caused an interpretation bias while evaluating the samples. This could be one of the probable reasons for the variation of the results achieved in the present study from that of their study. Furthermore, another fact to be considered is that all-in-one adhesive/flowable composite systems were chosen for comparing the sealing performance in that study. This is in contrast to the present study where, a total-etch adhesive/flowable composite was used as a standard for evaluating the sealing ability of self-adhering flowable composite. The effect of thermal cycling was not considered in their study; however, in the present study, 500 thermal cycles were performed. The number of specimens considered for SEM evaluation in their study, was limited to only two, which is in contrast to the current study where 22 samples belonging to Dyad flow group were evaluated under SEM. This difference in the selection of materials, consideration of thermal cycling, and the number of samples could have contributed to the variation in the results. On the basis of SEM results, it can be inferred that none of the groups could provide 100% perfect margins at the CEJ, regardless of the restorative material used. Nevertheless, when these flowable composites are to be recommended as a liner in Class II composite restorations, the use of Dyad flow would be preferred to Tetric N-Flow, as it simplifies the direct restorative procedure, thereby reducing the technique sensitivity and saving time. Marginal gaps of a restoration may also be created by improper manipulation of materials by operators. The manual sectioning technique of the samples using a diamond disc is highly cumbersome, technique sensitive, and the restoration structure itself can be altered due to the sectioning of the samples. To minimize the errors produced by the manual sectioning, hard-tissue microtome was used to section the samples in the present study. The marginal sealing ability was evaluated with the gingival seat prepared at the CEJ. However, the performance of this newer material would be better understood with the gingival margin/seat prepared at different levels of tooth substrate. Although in vitro testing of restorations is an important initial screening for the restorative materials, these results cannot be extrapolated in correlating with the clinical performance of restorations. Except for the simulation of temperature changes, other factors such as masticatory forces and pH fluctuations were not considered in this study. Hence, future research regarding in vitro, ex vivo studies, and randomized clinical trials are recommended while overcoming the above limitations in the present study. The marginal adaptation of the self-adhering flowable composite (Dyad flow) as a liner in Class II restorations was comparable to that of the conventional flowable composite (Tetric N-Flow). Casselli DS, Faria-e-Silva AL, Casselli H, Martins LR. Marginal adaptation of class V composite restorations submitted to thermal and mechanical cycling. J Appl Oral Sci 2013;21:68-73. Caroline Bruschi Alonso R, Maria Correr G, Gonçalves Cunha L, Flávia Sanches Borges A, Maria Puppin-Rontani R, Alexandre Coelho Sinhoreti M, et al. Dye staining gap test: An alternative method for assessing marginal gap formation in composite restorations. Acta Odontol Scand 2006;64:141-5. Sadeghi M, Lynch CD. The effect of flowable materials on the microleakage of class II composite restorations that extend apical to the cemento-enamel junction. Oper Dent 2009;34:306-11. Kerr Sybron Dental Specialties. Dyad Flow: Self-Adhering Flowable Composite. Technical Bulletin. Orange, CA: Kerr Sybron Dental Specialties; 2010. Blunck U, Zaslansky P. Enamel margin integrity of class I one-bottle all-in-one adhesives-based restorations. J Adhes Dent 2011;13:23-9. Fabianelli A, Pollington S, Davidson CL, Cagidiaco MC, Goracci C. The relevance of micro-leakage studies. Int Dent 2003;9:64-74. Naito T. Postoperative sensitivity in posterior composite restorations is relevant in class II cavities. J Evid Based Dent Pract 2008;8:225-6. Porto IC. Post-operative sensitivity on direct resin composite restorations: Clinical practice guidelines. Int J Res Dev 2012;1:1-12. Van Meerbeek B, Perdigão J, Lambrechts P, Vanherle G. The clinical performance of adhesives. J Dent 1998;26:1-20. Perdigão J, Lopes MM, Gomes G.In vitro bonding performance of self-etch adhesives: II – Ultramorphological evaluation. Oper Dent 2008;33:534-49. Unemori M, Matsuya Y, Akashi A, Goto Y, Akamine A. Self-etching adhesives and postoperative sensitivity. Am J Dent 2004;17:191-5. Perdigão J, Anauate-Netto C, Carmo AR, Hodges JS, Cordeiro HJ, Lewgoy HR, et al. The effect of adhesive and flowable composite on postoperative sensitivity: 2-week results. Quintessence Int 2004;35:777-84. El-Marhomy AM, Genaid TM, Abdalla AI. Effect of different configuration factors on marginal gap formation of two composite resin systems. Tanta Dent J 2013;10:160-7. Mann NS, Makkar S, Sharma R.In vitro comparative evaluation of microleakage in newly introduced dyad flow with total etch and self etch adhesives in class V resin composite restorations. J Nepal Dent Assoc 2015;15:33-8. Jankovic O, Radman IK, Adamovic T, Ilic S, Djeri A, Josipovic R. Marginal seal evaluation of self-etch flowable composite materials. Serbian Dent J 2013;60:200-9. Rengo C, Goracci C, Juloski J, Chieffi N, Giovannetti A, Vichi A, et al. Influence of phosphoric acid etching on microleakage of a self-etch adhesive and a self-adhering composite. Aust Dent J 2012;57:220-6. Bektas OO, Eren D, Akin EG, Akin H. Evaluation of a self-adhering flowable composite in terms of micro-shear bond strength and microleakage. Acta Odontol Scand 2013;71:541-6.